I know a small city that has lost its popularity and then its luster. It seems abandoned and haunted. Its glory is now faded but resilient. This is San Remo, Italy, on the border of France. San Remo had its heyday. I can see it in the 1940s architecture of its Casino and its "Gran Hotels". Just on the beach front, it has 3 or 4 hotels whose stars have turned off, one by one. I always feed on the images of Talented Mr.Ripley, when Matt Damon and Gweneth Paltrow visit the San Remo Jazz Festival at its heyday, in the 1950s. Very little has changed from those days. Even the tempo is the same. Just a little less hussle bustle. The Mediterranean gardens grow wild, the palms line the coast, the abandoned train station lies idle, as the tracks have moved to the outskirts of the city. 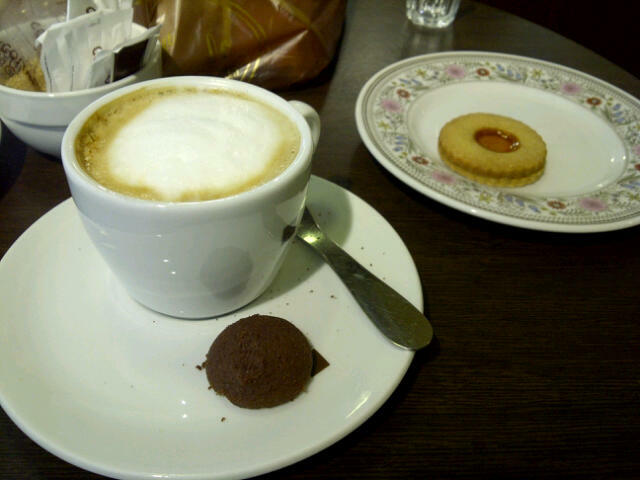 SanRemo is authentically Italian, without any marks of globalization. The Dolce Gabbana clad "caribbinieri" (cops), the coffee shops offering the best cappucinos, the pastry shops with their old fashioned recipes, the market overflowing with the largest variety of tomatoes in the world! I pretend to visit SanRemo frequently for the coffee and panini at breakfast only. It is my first priority.But I also enjoy the window shopping along the pedestrian streets, the market shopping with my father, the pastry selection, the shoe shop visits with my husband. My children tag along with their cousins to a quaint toy store that "curates" toys with Italian taste. My sons get their "annual haircut" which consists of an Italian hairdresser sheering them like lambs. 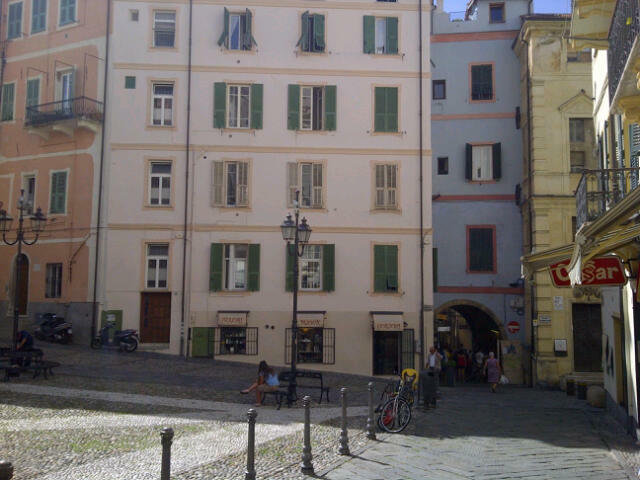 I walk along, studying the colored facades, noticing the laundry that hangs from them, the numerous chiming churches. 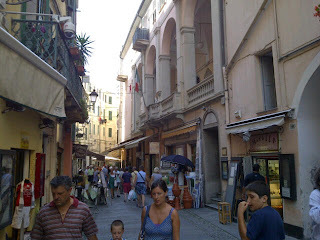 Wondering how SanRemo had been in its heyday, when American tourists visited. San Remo was best known for the signature of the peace treaty after WWI in 1920.Since then the beautiful town on the Italian Riviera lost it's luster,and became best known for its Tuesday and Saturday mercato for fake merchandise and cheap items.Yet few people know about it's vibrant covered mercato for foodstuffs and magnificent fruits and vegetables,cheeses and delicacies.It is a chef's dream place to shop for ingredients that have not been touched by high prices,since only the locals buy there. 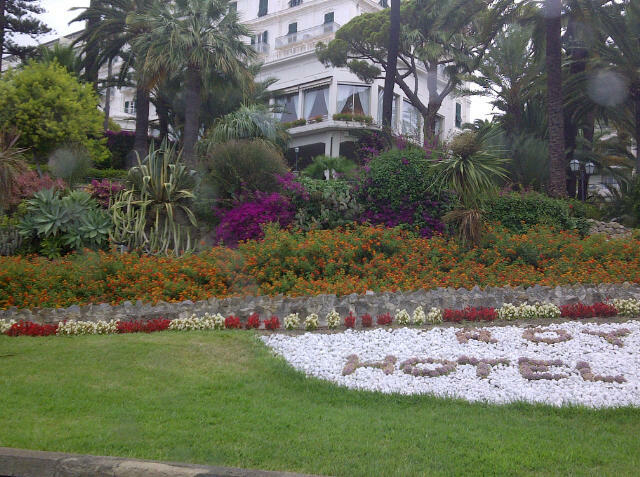 Recently San Remo is witnessing a revival,with its main street becoming closed to cars,it's old Hotel de Paris renovated to it's original beauty,the 4 star hotels renovated and sold as apartments to rich Russians. There is an air of relaxation and tranquility,common to Italian cities and towns,absent from the neighboring nervous cities and towns on the French Riviera.Despite the few tourist buses that offload retired north Europeans,San Remo remains friendly,relaxing and welcoming coastal town. A dear friend of mine recently asked me my thoughts about San Remo. I'll refer him to this blog. When I told him San Remo lost its lustre to its French competitors to its West or its compatriot resorts to its South, he made a very valuable observation "San Remo is like a microcosm of Italy's current ills under Berlusconi." This post was a beautiful portrait of San Remo. Its charm lies in its nostalgic beauty and its quaintness. It's quaint enough to enchant children, almost like a village from a fairy tale. I am positive our children could make their way alone by this point from Sabrina to the toy store. Maybe even in their sleep. The food market, where our father shops for the numerous hungry mouths that inhabit his home in the summer, is indeed beautiful. It makes me smile because here in NYC Eataly is but an attempt to replicate this market, where you can buy anything from fruit and vegetables, to cured meats, cheese, baby food and pastas of all shapes and colors. Your husband and I also like to do our "shoe shopping" at Franco's, where Hogans are always beautiful and of the latest style. Jewelery stores are amazing, with pieces that are stylish and wearable. 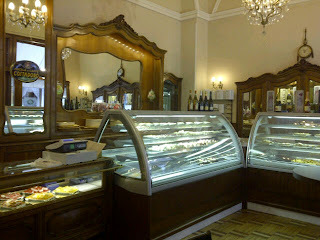 And I love our little pastry store, that I dream of replicating in NYC, merely to have that same experience here. Our trips to France would no longer be the same without our biweekly pilgrimages to San Remo. I feel like it's our personal family secret, and although it is popular with many others, nobody does San Remo the way we do!